View from the top of Diamond Head Volcano next to Waikiki shows perfect surfing waves and skies of blue. Image by Zach Dischner and used with permission. Thanks brah! Living in Hawaii came by accident for me. I joined the Air Force after high school and after ‘tech school’ I was flown off to Oahu, Hawaii to begin my amazing four year stay. Oahu is one of four main islands where most people in Hawaii live – Maui, Big Island, and Kauai are the others. Of these I’ve also live on Maui. When one thinks about living in Hawaii, it seems like it could be paradise for a lot of different activities, and styles of life. Is it though? For me, yes. It was thirty years ago when I first saw the islands, and today it is very clear in my mind that I’ve never found another place like it. Is Hawaii the Best Place for Exercise? Oahu is roughly 60 miles by 35 or 40 miles. It’s basically a rock with some dirt in the middle of the Pacific Ocean. There are over a million residents living on Oahu Island. If they were spread out across the island, it would probably seem a lot more crowded than it is. Luckily, most people live in one of two areas – town / Waikiki area, or Pearl City area and West. Add to that one million another six or more million visitors to Oahu each year and it makes the already busy areas even busier. Honolulu had the #1 to #3 worst traffic in the USA as voted by Forbes Magazine recently. That’s pretty bad. That said, if you lived on the North or Northeast shore, you’d see little of it. It never gets bad there, except during a surf event or when a massive swell (waves) hit the north shore and everyone on the island drives up to see them. 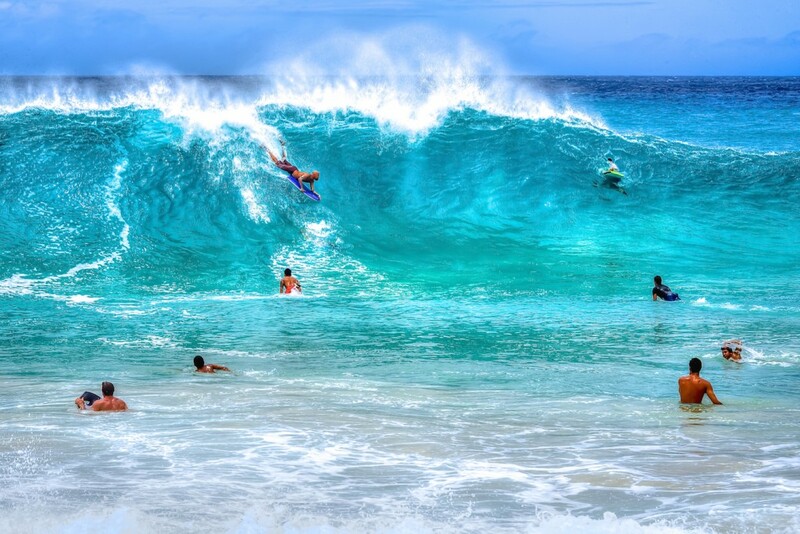 Bodyboarding at Sandy Beach near Makapu’u Beach on Oahu is great exercise, but a bit dangerous! One of my favorite images EVER. Image by Floyd Manzano at Flickr. There are many beautiful parks to exercise in. Exercise like aerobics, yoga, tennis, and other sports are common. Tennis is really common. There are lots of courts and lots of people who play. Bicycling and running are very common and the sidewalks are pretty good for running. The streets are dangerous with so many tourists on the road looking at Kamehameha Statues, and other awesome views. Personally, I found the trail running – and hiking – to be the best part of exercising while living on Oahu and Maui. There are dozens of great trails leading up to high peaks which offer magnificent views of the islands and shore, including even some of the off-shore islands. Trails with elevation gains of 2,000 feet and more are very common, as many trails lead right up to the Ko’olina Mountains which lay between Waikiki and Town areas and the Northeast Waimanalo side. Trails are generally not too technical, but there are sections where extreme amounts of roots exist. These are great places to roll ankles and yet, if you go slowly through these, you’ll come out in one piece. Awesome. The air is usually a bit humid and almost always warm. Only one time in a couple of years can you breathe smoke from the cold – at sea level. Some of the mountain peaks – especially far up around 10,000 feet above sea level, like at Haleakala Volcano on Maui, it is frigid cold even while experiencing hot summer weather below at sea level. Outside of Waikiki, Town, and Pearl City areas the air is always clean, and usually moving. The trade winds clear any bad air coming out of factories and automobiles on most days. Of course you wouldn’t want to run or bike during rush hours when levels of pollution are at their highest. Otherwise, the salty fresh air is perfect air to be breathing while exercising! A bike ride around the island is an especially good workout – over 100 miles and with gorgeous scenic views. Amazing view I had from the Hawaii Loa Summit hike on Oahu, just above Diamond Head Volcano and Waikiki. I found climbing fast and running up the summit trails to be the best exercise while in the Hawaiian Islands. Is Hawaii the Best Place for Healthy Living? Well, for exercise – it’s great. I’d even call Hawaii perfect for exercise. It’s rarely raining and when it does, it blows over quickly. There are tons of people you can exercise with – which makes it easy. There are so many places and different types of exercise, that you shouldn’t ever feel bored of doing the same thing over and over. How’s the Food in Hawaii? The variety and tastes of food in Hawaii are pure awesome. I know, I’m using awesome a lot. If the word fits, right? Because there are so many different people from different places living in Hawaii, the food is especially good. Get some simple Huli Huli chicken to see what I’m talking about. Get some Korean BBQ… my mouth is watering already. Get some fresh mangoes from kids selling on a table next to their house for $1 each. Or pineapples. Or guava. Or mountain apples. Or avocados. So many fresh fruits grow on the islands, and the rest is imported on massive ships from California and around the world. Many people start their day off with some surfing around 5:30 am, and just around sunrise. Others go for a run then or at night time after work. I used to go about 9 pm for my nightly run around the Ala Wai Canal in Waikiki, all the way over to Diamond Head and the park. I’d do a couple laps of the park and then head back home to my apartment behind the Ala Moana Mall on Hobron Street. Hawaii – at least Oahu, and Maui, are just perfect for people looking for living a healthy lifestyle with great food, clean air, and a multitude of different exercise possibilities. There are thousands of people out exercising in the streets and parks during morning and night, and you will have plenty of company. The expense of living in Hawaii is what puts a lot of people off. If you can’t make the money to stay in a decent place, and put your kids in private schools (public schools are poor), you may want to choose another place. Thailand for instance. I’ve been here for 11 yrs and it would give Hawaii a strong run for the money as an incredible destination for healthy living and exercise. If you have any questions about living in Hawaii, a dream destination for exercise and healthy lifestyle – read more at AimforAwesome, and feel free to give me a note through the contact form there if you have anything specific to talk about. Here’s a page with links to hundreds of articles about living in Hawaii that you might find helpful.